Dampney Company Inc has introduced a new, ready to use heat-resistant white paint that is non-yellowing at elevated temperatures for a wide range of coating applications. Thurmalox 290-00 heat resistant white paint features a proprietary formulation that prevents yellowing at up to 1,200°F and is suitable for a wide range of industrial, commercial, and consumer product applications. Unlike conventional high-heat white paints that yellow at elevated temperatures, this paint remains white and will not chip, crack, or peel. 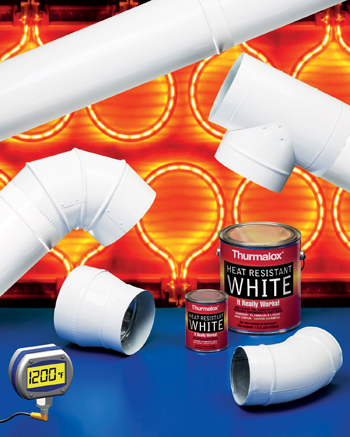 Designed for painting vent pipes and other parts exposed to 1,200°F, Thurmalox 290-00 heat resistant white paint can be used with Dampney’s clear gloss top coat to achieve a porcelain-like finish. Ideal for wood stoves, BBQ grills and smokers, chemical plants, refineries, process vent piping, and more, this paint is not intended for direct contact with flames. The new product is available in five-gallon pails, gallons, quarts, and aerosol spray cans and priced according to packaging and quantity. Dampney Company was founded in 1917 and has designed, developed, manufactured, and distributed a wide range of engineered coating systems for specialised applications since that time. A leader supplying high-performance, high temperature protective coating solutions throughout the world, the company serves the refining, petrochemical, chemical processing, oil and gas, pipeline, power, OEM, pulp and paper, materials processing, construction, and water and waste processing industries. Their primary product lines include Thurmalox, a high temperature industrial and OEM protective coating; Epodur for secondary containment; Apexior for water-side protection in steam-generating equipment; Dymacryl water-repellent masonry stains; Elastoid, a high-build elastomeric rubber coating; Endcor, a corrosion-resistant coating; and Epodur, a high solids epoxy coating. Dampney continues to develop and improve innovative, right-the-first-time coating systems for protection against hostile environments in atmospheric, immersion, and underground applications. Coating systems are based on a broad range of polymers and pigments resistant to chemicals, extreme heat, and weather. Individual coatings and systems are tailored for application to masonry, metal, plastic, and wooden surfaces.